The Customize Windows > Computer and Internet > General > Why No Output From Ubuntu 16.04 service start/stop Command? Why No Output From Ubuntu 16.04 service start/stop Command? Service nginx reload/restart Gives No Output Unlike 14.01. Is not it? This Article Explains Why No Output From Ubuntu 16.04 service start/stop Command. We should not be expecting such output. Earlier Ubuntu versions didn’t behave this way because Ubuntu was an upstart system for a decade. In Ubuntu 15.04 and later version, systemd is only fully supported. So, that change from upstart to systemd made few changes. Commands actually changed and usually kind of linked with service commands with scripts. Not Understood! Why No Output From Ubuntu 16.04 service start/stop Command? Now Understood. Is There Some Way to Get Output From Ubuntu 16.04 service start/stop Command? root@abhishekghosh:~# /etc/init.d/nginx restart [ ok ] Restarting nginx (via systemctl): nginx.service. 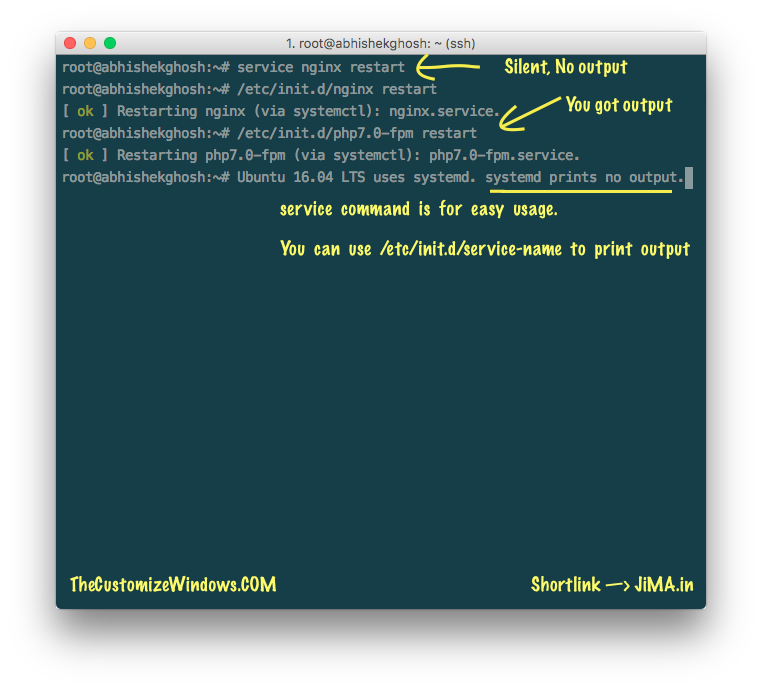 root@abhishekghosh:~# /etc/init.d/php7.0-fpm restart [ ok ] Restarting php7.0-fpm (via systemctl): php7.0-fpm.service. [ ok ] Restarting php7.0-fpm (via systemctl): php7.0-fpm.service. You can use /etc/init.d/ to print output on Ubuntu or simply switch to CentOS from Ubuntu. Actually CentOS at current situation is easier like Debian, Ubuntu to any kind of user. This Article Has Been Shared 4958 Times! Articles Related to Why No Output From Ubuntu 16.04 service start/stop Command? Here Are Some Must Know GNU/Linux Commands For the SSH Users Who Are Relatively Newer and Primarily Managing Own Servers to Run their Websites. Midnight Commander Has a Text Based User Interface & Can Be Used on All OS. Here is How To Install Command Line File Manager on Ubuntu Server. Title: Why No Output From Ubuntu 16.04 service start/stop Command? Cite this article as: Abhishek Ghosh, "Why No Output From Ubuntu 16.04 service start/stop Command?," in The Customize Windows, November 17, 2016, April 21, 2019, https://thecustomizewindows.com/2016/11/no-output-ubuntu-16-04-service-startstop-command/.